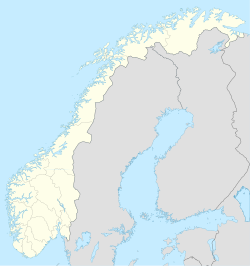 Lyngseidet (also Northern Sami: Ivgumuotki or Kven: Yykeänmuotka) is the administrative centre of Lyngen Municipality in Troms county, Norway. The village is located on an isthmus that is about 3 km (1.9 mi) wide between an arm of the Ullsfjorden and the Lyngenfjorden. The village is home to a grocery store, Lyngen Church, nursing home, schools, daycare, and library. The plastic Santa Claus named Gollis is also located here. Lyngseidet is located 15 km (9.3 mi) north of the village of Furuflaten and 12 km (7.5 mi) by ferry from Olderdalen, in the neighboring Kåfjord Municipality. The 0.87-square-kilometre (210-acre) village has a population (2017) of 819 which gives the village a population density of 941 inhabitants per square kilometre (2,440/sq mi). ^ "Lyngseidet, Lyngen (Troms)". yr.no. Retrieved 2018-08-07. This page was last edited on 7 August 2018, at 20:05 (UTC).